The Samsung Galaxy Grand Prime is finding a new over the air update arriving to the notification panel if you have the G531F model number. Those of you with root access to the Grand Prime’s internal system already should update manually and not over the air. You can expect your Grand Prime smartphone to be updated with more material design elements, improvements to Samsung’s TouchWiz, plenty of bug fixes and additional enhancements. You must have the Samsung Galaxy Grand Prime with the SM-G531F model number to follow this guide. There are a few versions of the Samsung Galaxy Grand Prime, so make sure you do not flash the firmware in this guide on the wrong model number or else you will probably find that device bricked. You can check out your Grand Prime’s model number by tapping on the Menu > Settings > About Device > Model Number. Download the Samsung USB Drivers  and install them on your computer before they are running. Just extract the driver package on the desktop and click on the .exe. file to run them and you should be fine to continue. Enable the USB Debugging Mode on your Samsung Galaxy Grand Prime smartphone by tapping on the Menu > Settings > Developer Options > USB Debugging Mode. Download the Android 5.1.1 G531FXXU1APA1 firmware update from this link . Right-click the file and choose the “extract here” option from the menu so you can see the firmware file on your desktop. Download the Odin flashing tool from this link  and extract it the same way as the firmware. 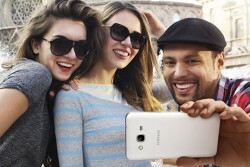 Boot the Samsung Galaxy Grand Prime smartphone to download mode. Connect the Samsung Galaxy Grand Prime to the computer with the USB cable. Click the AP button and browse the desktop for the G531FXXU1APA1 firmware file ending in tar.md5. Wait until the Odin user-interface on the computer gives you the pass message and your device reboots. Now you can find out how to root the Samsung Galaxy Grand Prime SM-G531F  smartphone running on the latest Android 5.1.1 Lollipop update using the CF-Auto-Root tool by Chainfire. Alternatively, you might prefer checking out how to install TWRP Recovery on the Samsung Galaxy Grand Prime SM-G531F  smartphone so you can start installing some new ROMs, flash some custom kernels, or take complete backups thanks to the NANDroid option.